When I think of bafun uni, I usually relate that to the best place on Earth, Vancouver. Yep. This is where I first had the taste of this very delectable, succulent seafood treat. And once you taste it, there’s no going back. Suddenly, the local version just doesn’t come at par with them. Imagine my delight when I found it here, in Manila! Just a stone throw’s away from my house! Miyazaki is a new restaurant in Molito Complex in Alabang. If you’re coming from the main road adjacent to Ayala Corporate Center, it’s easy to miss it because it’s on the left side of an uphill entrance to the vicinity. I had to walk back to get here under the scorching sun. I came in at exactly 11am and had to practically knock on their glass doors and beg them to let me in LOL. Little did I know, it will all be worth it. Servers came to my table offering me the menu, a glass of water, and just hovering here and there, a few steps away to give me my much needed space. I looked at their menus, they gave me two, 1st is with illustrations (maybe for someone who’s not Japanese cuisine fluent, so they know what they’re getting haha) but it was a little incomplete compared to the 2nd one, where it’s just a plain textbook from start to end. That second menu was packed with their long list of dishes, I know it’s a bad sign, because you might think they don’t have a specialty, but really! Let go of all your inhibitions. I hailed a server and ordered. Even for the price, I was expecting they will serve local uni, so I asked my server to confirm and not raise my hopes up at the same time, but she gave me an indignant and resounding “No, ma’am, we serve bafun uni!” I had to repeat it, those last two words, like a poor mimic, I’m pretty sure I garbled them too, but she nodded again “Yes, ma’am, bafun uni.” That’s great! I told her. And now the wait, looking around the resto, there were wooden chairs and tables, and wooden decors hanging on the wall and ceiling. I’m thinking they’re channeling a small, cozy Japanese resto and I’m so glad I dined here. My Tempura Uni came first. 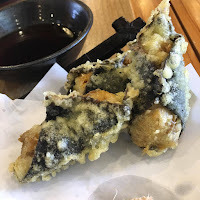 These were rolls of bafun uni (for days) wrapped by a single sheet of nori, dipped in their tempura batter, and then deep fried. The exterior was quite crunchy and the uni inside was untouched and glorious! Still sweet and delicate and ugh. Any uni lover would love this. 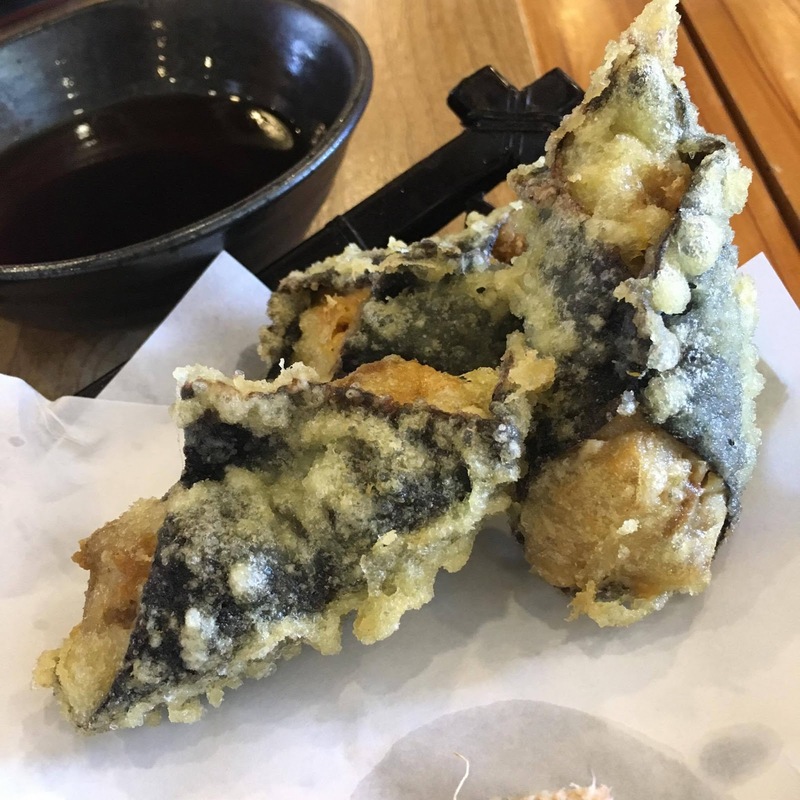 When it comes to tempura, this is the bomb. And for my main dish, ta da! 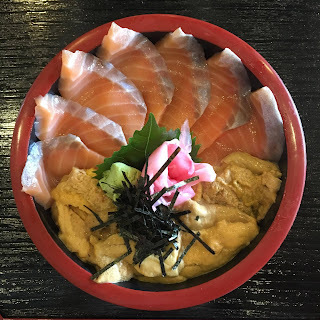 Salmon Uni Don. Its name is so great, I have to type it again like this: Salmon. Uni. Don. The salmon sashimi could easily and completely wrap your finger, no, two fingers! And you could tie it together with a knot! 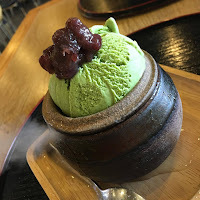 Evenly and uniformly sliced, they were arranged in a fan like manner on my bowl on top of that magnificent Japanese rice, which stood out on its own really, being properly cooked and seasoned. And of course, that bowl was generously filled with my personal favorite, bafun uni. And oh! I feel like I’m back in Vancouver (but nah)! This bowl was adorned with gari, wasabi, nori strips, and a green leaf. Ain’t she pretty? I’d gamble that this resto is probably the highest rating I’ll give to a Japanese restaurant here in Manila, scratch that, the whole Philippines! I need to check all my reviews for that, because as long as Japanese restos are concerned, this has set the bar really high. It’s a little pricey but you must pay up for something so valuable, yes? Overall taste was great and I’d guarantee you’d enjoy it here. I simply can’t stop thinking of it! Seriously. Please take me with you! Or come on, I’ll take you!